There have been frequent comparisons drawn between Marie Antoinette, the last queen of France before the revolution, and Alexandra Feodorovna, the last empress of all the Russias. Both arrived from foreign courts full of youth and inexperience, both were initially adored by their adopted people yet later vilified by them, and both were to meet tragic and brutal ends. The mournful comparison is popular, and the romantic myth has plagued popular histories published since the Russian Revolution; however, the story that Alexandra Feodorovna occupied the rooms of Marie Antoinette at Versailles is false, as a rediscovered French primary source reveals. The myth of the “Night at Versailles” first appears in Baroness Buxhoeveden’s “The Life and Tragedy of Empress Alexandra Feodorovna” in 1928. The story was repeated in Robert K Massie’s “Nicholas & Alexandra,” in which Massie writes simply: “at Versailles for an evening, Alexandra was assigned the rooms of Marie Antoinette…” citing Buxhoeveden for the information. Bukshoeveden, it appears, is to blame for the cascade of false repetitions about the Empress’ visit and purportedly tragic associations. “According to Antonia Fraser’s biography [of Marie Antoinette], Alexandra was “delighted” (Antonia Fraser, Marie Antoinette: The Journey, Pg 538, 2000) with being given Marie Antoinette’s rooms, which presumably, given the fact that she stayed overnight, must have been the glorious Queen’s State Bedchamber, as there is no mention of the Trianon, nor did Marie Antoinette’s private quarters contain her bed. Alexandra’s biographer, Greg King, states that in Marie Antoinette’s rooms, Alexandra spent the night underneath “the damask canopy of the doomed queen’s bed”, citing Alexandra’s earlier biographer Baroness Buxhoeveden, for this (Greg King, The Last Empress, Pg 115, 1994). The “evening” at Versailles has suddenly become an overnight stay, and the Empress is not simply visiting Versailles, but duplicating the experience of Marie Antoinette by sleeping peacefully in her rooms, in her bed in the lap of luxury, blissfully unaware of her fate. The Frontispiece of the Official report of the Imperial visit of 1896. However, a primary French source of the Russian state visit overlooked by Russian memoirists and historians survives in the form of an official publication: the Relation officielle des fêtes organisées par la ville de Paris pour la visite de LL. MM. II L'Empereur et L'Impératrice de Russie les 6, 7 et 8 Octobre 1896. Executed under the auspices of the Conseil Municipale de Paris and published by the Imprimerie Nationale in 1897, this is a definitive government account of the visit. Unlike the hazy reportage of the Baroness Bukshoeveden published in 1928, the actual schedules of the Emperor and Empress for each day are published, with illustrations of many of the events which occurred, as well as images of the most important state gifts which were presented to the Imperial couple[ii]. The trip to Paris was a cascade of social events and visits including a state dinner at the Elysée Palace, galas at the Opéra and the Comédie Française, visits to the Invalides, the Panthéon, and the Cathedral of Nôtre-Dame, the laying of the cornerstone of the Pont Alexandre III, presentations and lectures at The Palais de Justice, the Hôtel des Monnaies (the Mint), and the Académie Française, a reception at the Hotel de Ville, and a trip to the Gobelins Tapestry manufactory. The Imperial train with the Emperor and Empress arrived at Versailles at noon, where they were greeted by throngs of Parisians who had come to see them arrive at the Palace. The park at Versailles had been cleared of all visitors, so that the Imperial couple could view the palace and its grounds as if they were alone. It was noted that the trees had taken on their full autumn splendor, and that the play of the midday light on the fountains made a stark contrast to Paris, where the spectacles were artificial and man-made. The Imperial couple were then escorted to the apartments where they would rest and change for dinner, for which the rooms placed at their disposal were not those of Marie Antoinette, but those of Louis XV. 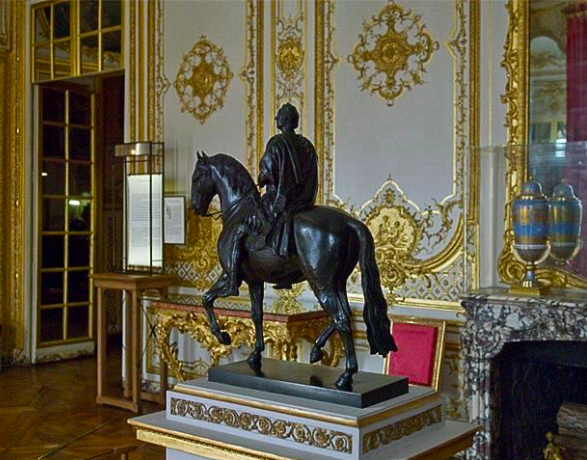 “…The first is a resting-place for the Empress, entirely furnished in Louis XV. A masterpiece by Nattier, the portrait of Mlle. Louise as a Child rested upon a flowered easel; with flowers upon the consoles and on the mantel, fine and delicate greenery attached to the mirrors, orchids nestled amongst ferns, and especially, the golden roses and violets that the Empress likes. 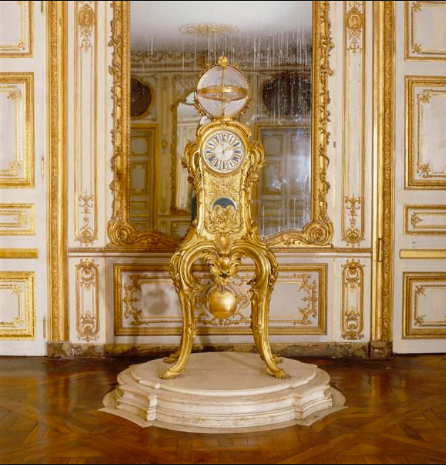 This is all to be found in the dressing room of Louis XVI which opens onto an alcove, itself embellished with the light garlands of a tapestry by Coypel. The Corner salon, which was provided for the use of Nicholas II. 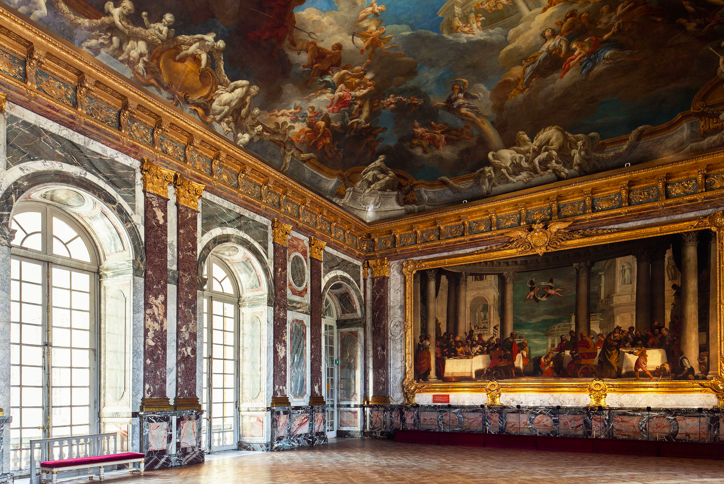 The Galerie des batailles, the site of the gala dinner in october 1896.
the salon d’hercule at the palace of versailles, the site of the evening’s entertainment, october 1896. At the end of the performance, at half-after eleven o’clock, Nicholas and Alexandra were escorted to the train station at Versailles by the President, and boarded the Imperial train[v], which departed for the Camp de Châlons, where, the next morning, the Emperor and Empress were set to review the troops. (ibid, p. 145). So, we see that Alexandra Feodorovna was not assigned Marie Antoinette’s rooms, and, it appears, she did not even visit them during her time at Versailles. Had the Empress visited the State Bedchamber of the Queen in 1896, she would not have found a room ready for her occupation. In fact, when the Empress visited the palace, the rooms of Marie Antoinette looked very different than they do to us today; stripped of its furnishings, the room would have retained only part of its mid-19th century appearance. Unrestored, and missing almost all of the original 18th century furnishings (including the famed state bed in which Alexandra was supposed to have slept, now lost), what the Empress would have seen was an empty room hung only with mid-19th century silk damask placed on the walls during the hasty repairs and renovations of the reigns of King Louis-Phillippe and Emperor Napoleon III. 1955. The first phase of the restoration of the Queen’s bedchamber showing the sumptuous textiles rewoven at lyon, and several pieces returned to the chateau in the 20th century. Photograph by permission of and © 2019 The Granger Collection LTD d/b/a GRANGER - Historical Picture Archive. All rights reserved. The picture above shows the room only after the first phase of post-WWII restorations, after reproductions of the exquisite 18th century silk wall hangings were re-woven in Lyon using the original patterns. In this 1955 image, we see a period copy of the famous 1778 portrait of the Queen by Elisabeth Vigée-Lebrun (the original of which is now in the Vienna Kusnthistorisches museum) which fills the empty bed alcove. The unfinished 1791 Kucharski portrait of the queen is displayed on an easel in the room for post-war museum visitors to compare to the Vigée in an evocative “before and after” display. The firescreen by Jean-Baptiste Claude Sené (1787) was returned to the Château only in 1939, the jewel chest by Schwerdfeger was transferred back to the chateau in 1933. Another piece on display associated with Marie Antoinette is the famous mother-of-pearl desk by Jean Henri Riesner made for the Palace of Fontainebleau — but the State Bed and bois doré guard-rail recreated from contemporary drawings of the 18th century would not reappear until the late 1960’s, and most certainly were not there for Alexandra Feodorovna’s comfort in 1896. The questions that this brief piece raises are interesting. Did Baroness Buxhoeveden invent the story of the “night at Versailles” to sell her book? In 1928 did she simply misremember the details of more than 30 years before? [vi] Was Empress Alexandra misinformed about where she was rested during her stay, or perhaps she herself misremembered which rooms she occupied? Could the Empress have told her daughters that she was in Marie Antoinette’s rooms in front of Baroness Buxhoeveden? We may never know the truth – but what is true is that even when using memoirs, historians of the Russian Imperial family must always check primary and secondary sources for multiple confirmations before repeating many of the myths which have been put forth without question for more than 100 years. © 2019 Nicholas B.A. Nicholson and Nicholson Advisory. All rights reserved. [ii] It is well to note that the 1887 reproduction of a Gobelins tapestry depicting Marie Antoinette after the painting “Marie Antoinette et ses enfants” of 1787 by Elisabeth Vigée-Lebrun is not listed among the official gifts. The tapestry now at the Alexander Palace was likely not officially presented as a state gift, but later presented to Alexandra Feodorovna. Anatoly Kuchumov noted that the tapestry ‘was a gift of former French President Lebrun.” President Lebrun was the last president of France’s Third Republic from 1932 until 1940. In 1896, he would have been 25, and did not enter politics until he was 30. He joined the Chambre des Deputés in 1900, later serving as Minister for the Colonies from 1912–1914, Minister of War in 1913. Interesting to know when the gift might have been made? If Kuchumov meant President Émile Loubet, the tapestry would have had to be presented after 1906. [iii] Relation officielle des fêtes organisées par la ville de Paris pour la visite de LL. MM. II L'Empereur et L'Impératrice de Russie les 6, 7 et 8 Octobre 1896, Imprimerie Nationale, Paris: 1897. Translations of the original French text by the author. [iv] The Suite of the Emperor and Empress was composed of: HE Count Woronzoff-Dashkoff, Minister of the Court. H.E. Mr. Ghichkin, Secretary of State and Manager of the Ministry of Foreign Affairs. General Richter, Head of the House Military, Prince Alexander Dolgorouky, Grand Master of Ceremonies. Count Orloff-Davidoff, Grand Equerry. Count de Benkendorff, Marshal of the Court. Prince Nicolas Dolgorouky, general Aide-de-camp. M. de Hessé, General aide-de-camp. Count Olsoufieff, General aide-de-camp. Rear-Admiral Lohmen, Commander of the Imperial Yachts. Count Hendrikoff, attached to the person of HM the Empress. Prince Serge Galitzine, in the role of equerry. Prince Obolensky, Captain, Aide de camp of HM the Emperor. Prince Dolgorouky, Lieutenant and aide-de-camp to HM the Emperor. In addition, the Empress was attended by Princess Galitzine, Princess Obolensky, and Madame Naryshkin. [v] Buxhoeveden notes that the Imperial Couple were sent to the Camp de Châlons on the Imperial train of Napoleon III, unused since 1870. The Relation officielle only notes that there were special cars for the use of the Imperial couple and their entourage attached in some cases to the Presidential train, and in other cases to regular French locomotives. [vi]Cf note iii; Baroness Buxhoeveden was not among the suite with the Imperial couple at Versailles in 1896.